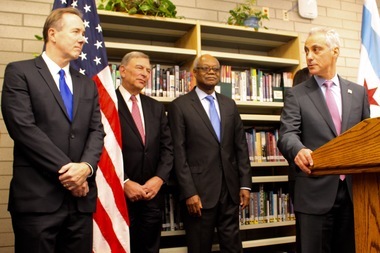 CPS CEO Forrest Claypool (l.) and Mayor Rahm Emanuel (r.) reportedly supported efforts to get parents to lobby Illinois legislators for a budget deal. CHICAGO — Chicago Public Schools is pleading with parents to lobby their legislators because they say the months-long budget standoff in Springfield will lead to devastating cuts, including 5,000 teacher positions, ABC7 News reported Friday. In an "unprecedented" plan that met Mayor Rahm Emanuel's personal approval, district officials will provide parents with a list of facts and arguments outlining the dangers posed to education by a non-existent budget, the outlet reported. "Chicago has been cut by hundreds of millions of dollars by Springfield," said CPS CEO Forrest Claypool, according to ABC. "Those policies are wrong. They're potentially illegal, they're immoral... if Springfield doesn't act, we cannot keep those cuts out of our classroom." If the state doesn't settle on a budget that includes $480 million for teacher pensions, Claypool and his team will have to intensify cuts to staff and salaries after December. The district's budget for the 2015-16 school year factored that state funding into its revenue, even though there's now no guarantee it's coming. If there is no budget deal by November, CPS would cut 5,000 teachers by the start of the second semester, ABC reported. Chicago Teachers Union President Jesse Sharkey criticized CPS's political strategy, meanwhile, calling it a "hail mary pass to parents to shift blame," according to ABC. CPS and CTU spokespeople did not immediately respond to requests for comment Friday night. Are you a CPS parent who has received one of these letters? Let us know via social media or email us at chicago-newsroom@dnainfo.com.